The school was founded in 1685 and moved to its present site in 1928, when the new building was opened by the Prince of Wales (later Edward VIII). This coincided with the development of London County Council's blocks of flats built in the locality, which was followed by the familiar 1930s units constructed on both sides of the famous old cricket ground. World famous cluster of gasholders (gasometers) on the east side of the ground. 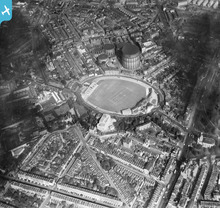 A view looking east-north-east across the famous old ground, which was developed in the 1840s and soon became the headquarters of Surrey County Cricket Club. The first Test match was played here in 1880, when WG Grace scored 152 and England beat Australia by five wickets. 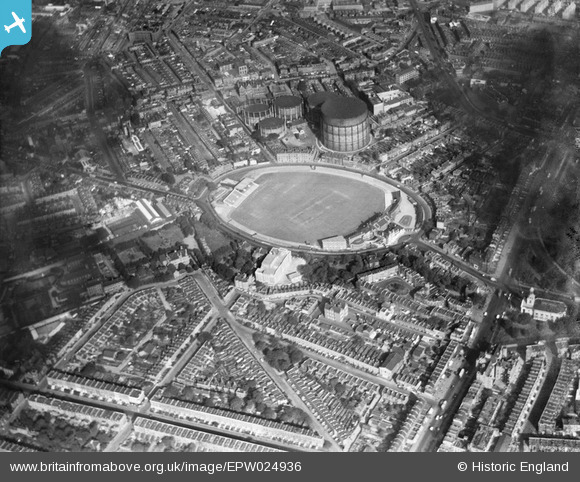 In its early days, the Oval also hosted international soccer and rugby matches. This picture was taken just over two years after England had regained the Ashes from the Australians in August 1926. Ten seasons later, Len Hutton would score a world record 364 against the Aussies, which is still the highest individual score by an English Test batsman.